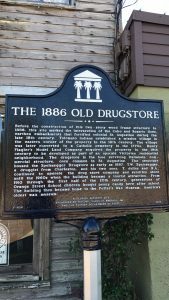 For a comparison with today’s high-tech pharmacies, be sure to stop in a popular St Augustine attraction, The Oldest Drug Store. The Drugstore is located right in the heart of the old city just steps away from the Agustin Inn Bed and Breakfast. You won’t see any computers or pill dispensaries here – instead, antique cash registers, wood floors and bottles of old but effective remedies, elixirs and tonics! These are most certainly a charming representation of an era gone by! Upon entering you will step back into time with greetings from the local pharmacist behind the counter ready to offer up a remedy to your dilemma. Built in 1886, the old Orange Street structure became the Speissegger Drugstore in 1887. According to its historic landmarker, the drugstore was operated by T.W. Speissegger and his sons T. Julius and R.A. until the 1960s. The store then became a tourist attraction and was most recently owned by the Harris Foundation. Today, the store is owned by Historic Tours of America and remains an attraction within an attraction. Potter’s Wax Museum is housed in the same property with the drugstore just off to the side of the wax museum entrance. Not to be confused with a Harry Potter Museum (although he is inside), this is a wax museum with an extensive collection. It was initially inspired by a visit to the original Madame Tussaud’s in London. George Potter’s Wax Museum was established in 1949 and remains the oldest in the country. With close to 160 figures and heads, the museum houses everyone from historic figures and past U.S. presidents and modern-day movie stars! Potter’s Wax Museum and the Oldest Drug Store are open every day of the year besides Christmas from 9:00 a.m. until 6:00 p.m. Tickets can be purchased onsite and are 9.99 for adults and 5.99 for children. Be sure to stop in here and many St Augustine Attractions when you stay with us at the Agustin! We are filling up fast for the holiday season and booking into the New Year. The Night’s of Light’s Holiday Season runs through January 31st, 2018! Even after the holiday rush, the lights will sparkle throughout the historic district for your viewing pleasure. Potter’s Wax Museum in St. Augustine Is One of the Best Attractions in the State!